Navigation through a World that's Wild at Heart and Weird on Top. 1. Leaving Winedale: After many heartfelt goodbyes, the Syam family has to return to the parking grounds to find my father’s missing cell phone. Afterwards, I take a piss behind our van, only to be caught in the security guard’s headlights. After scurrying back into the car, I realize that my last contribution to Winedale is urine. 2. Leaving the Buis' house: As I pull my keys out of my pocket the bottle opener keychain falls off after two years of trusty service. Joey later interpreted this as a sign I might give up drinking but hell, I ain’t no teetotaler. I’m not sure what it’s a sign for, but it’s a sign, no doubt. 3. This Week in Houston: If there were ever a deterrant for living in Texas, it’s Houston. Houston really is the anti-Austin, as much as I hadn’t believed it before. They are making the highway 6 lanes both ways throughout the city. SIX! That is, for you liberal arts majors out there, twelve lanes across—not even Marlon Brando’s beltline was so big. And since I’ve been here it’s either Cost-Co, or Best Buy, or REI, or some other chain store to visit and drive me batty. I need my city to have some personality, something Houston’s sorely lacking. 4. Leaving Friends: I prefer to think of it as prolonged absence. Then disappearance. Then wistful recollection supplemented with lighthearted mockery. Who are we kidding, though? I’ve been gone for a long time. But it’s the second kind of formative that really makes books, novels, literature, creation, life itself special. These are the works that don’t give you impressions but impress upon you. They are rare indeed, these rattlers, these stories that change the way you perceive yourself or others. Last week I was blessed enough to have been so impressed by a graphic novel, It’s A Bird. Now, It’s A Bird is an experimentally genius graphic novel. It imagines art and the page of a comic as few have before. But that’s formative in the first. 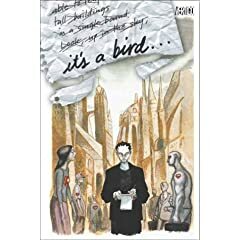 Upon reading It’s A Bird a second time though, the arc of the main character, a writer offered but against the job of writing the Superman comic, who struggles with disease and death in his family, really affected me. It hit home personally because of the way the writer failed in his interactions with others: his pride, his silence, his refusal to cope through others. Maybe it’s because I’m at a sort of crossroads in my life, but rereading the graphic novel, I kept thinking, This is me. These are my faults. The way he managed to cope with his problems spelled out to me what I should be doing with my own, and why my own actions were stupid and selfish. Sometimes we get lucky, and a piece of art challenges our concept of who we are, personally. This is the second kind of formative.